Just completed another commissioned sports painting, this time of a wrestler. 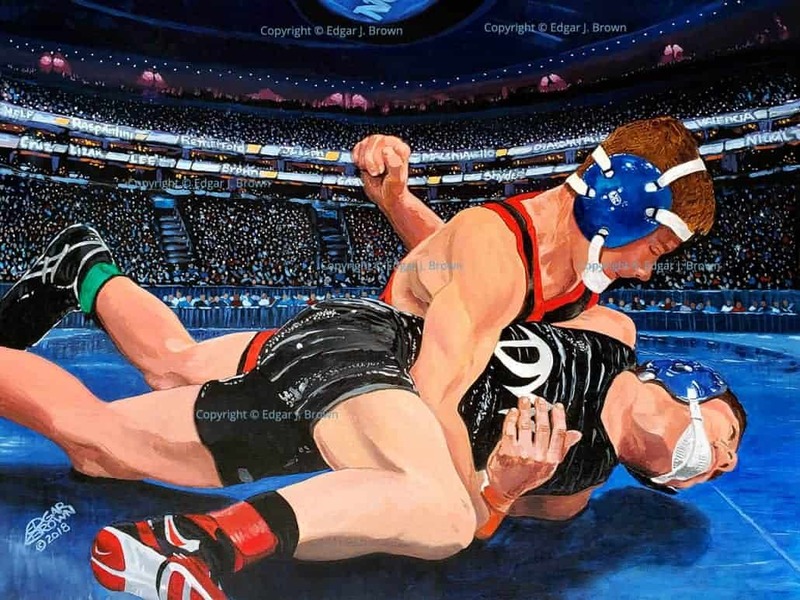 The wrestling painting is of Nicky Raspantini a young emerging wrestling stud from New Jersey. The fine art sports painting captures what it would feel like to wrestle in the NCAA finals, Madison Square Garden crowd going nuts and the names of the top college wrestlers glowing from the lights. The Adversity a wrestler goes through just to get to this place..to win..to get your hand raised in the NCAA Wrestling Tournament is as tough as it gets. Some of the college wrestlers names that appear in this painting. BROWN, LEE, CRUZ, LIZAK, RETHERFORD, JOSEPH, VALENCIA, SNYDER, GROSS, NOLF, etc. The 2018 original acrylic painting is 30″ x 40″ on museum quality canvas.